Showing results for tags '2500hd'. 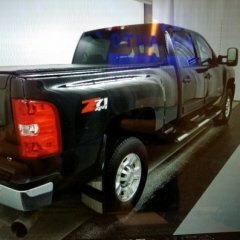 Hey all, I own a 2018 Silverado 2500HD LTZ Z71...The damn headlights are that terrible yellow color, Did Chevy not put LED lights on any of the 2500 models? Has anyone replaced the whole light assembly or even just bulbs to achieve the clearer look? If so please share and checkout the photo below of my headlights compared to the illuminated bow tie. Thanks for the help. I replaced these wheels with aftermarket at the 2,000 mile mark. They are like new, as you can see in the pictures. I'm selling them all together (four Denali wheels, the spare, and five Goodyear Wranglers with full tread life). The Wranglers are 265/70R18. The 8x180 lug pattern is for the HDs, but they can be adapted to different lug patterns if you're trying to update an older model truck. They're all beautiful with no curb scuffs or damage of any kind. I'm asking $1800 for all, but I'm somewhat flexible on that if you make a solid offer early. You can come pick them up, or I'm willing to ship them if you're willing to pay the shipping. PM me if interested or post publicly if you have any questions that could benefit the group. Heat on passenger side, and very intermittent heat on drivers side. 2003 Silverado 2500HD gasser. Just got the truck about 6 months ago so I'm not to sure what kind of history, or other work my truck has had done to it previously. Right when I got the truck I started losing my fan settings. I only had 4 and 5. Heat was working better then than it is now. Anyways, I replaced the blower motor resistor and that fixed my fan problem. The heat has always been intermittent on the driver side though. And recently it hardly ever works. It's winter now, and here in Illinois its pretty cold. So I would like to get this fixed ASAP. If i mess with the temp. controls it will sometimes switch to heat for me. I can hear the blend door opening and closing. What is my problem. Any questions or clarifications I'd be more than happy to answer! Thanks again. I have a 2002 2500HD Silverado. It is 2 Wheel Drive, 6.0L, with the Gov-Loc Differential. Recently my axle shaft snapped, when it did it also cracked the housing. I have a replacement ordered that doesn't have the backing plate or brakes. I am currently in a different town than the truck is so I was wondering what tools I will be needing to take the rear end off of the truck, take the brakes off of that one, put it on the new one and put the new one under my truck. What size bolts and if you can also what tension everything will need to be. It is the gt5 g80. I'm having a Lift Pump added on my 2008 Duramax. I've spoken with three good diesel mechanics and they all swear by a different brand. One says BD System the other Fast Fuel System and the third says the Raptor System. Based on reputation I'd go with the BD but the other two have lifetime warranties and the BD only has a 5 year. Which one do you think I should go with? Trading in my Silverado 2500 HD... Suggestions on Good Years To Buy? I currently have a 2011 Chevy Silverado 2500 HD 4x4 Diesel Crew Cab, short bed. It's my perfect truck, it's exactly what I want, it's exactly what I need. I have equity in it and I decided to refinance... It has 152K miles. Bank said, you qualify for the loan but your truck doesn't : - ( Truck has to be under 125K miles. It can be an older truck but not high miles. So I'm in the market for basically the same thing but lower miles. I'm wanting to keep my price down, cash in on some equity and keep my payments the same or lower. If A truck at $20K gets my payments lower. $25K my payments are the same. $30K my payments go up. I don't want to go over $30K unless there's a compelling reason to do so. My truck gets used 4 to 6 times per month on average. Either to haul hay or haul horses. I'm leaning towards more of a ranch vehicle right now. At the same time, I've got a 2011 and I'm not super excited about downgrading either. I'd just keep mine but I need to take my equity and pay off some higher interest loans. I'd appreciate some suggestions... Here's what I've been looking at: A 2005 Silverado 3500 HD fully loaded for $20K with 123K miles on it. The only thing it doesn't have is the exhaust brake which I can add. Are the 2005's a good way to go? This one is local. Next one up is a 2011 GMC Sierra 2500 Extended Cab 116K miles for $25K I'm looking at two 2013's -- a Sierra 3500 ext. cab for $30K with 120K miles (local) and a Silverado crew cab with 115K miles for $28K (8 hours away) I drove a 2012 with 80K miles that I can probably get for around $34K It's over my budget but what a nice truck! This one is local The best deal I've found is 3 hours away on a 2015 Silverado 2500LT for 30K with low miles. If that one is still available I might have to go for it just because it's a great deal! Only three of the trucks on this list are close by. The best deals on this list I'd have to travel a couple hundred miles to get to 'em. What are some other great years to consider? Should I consider anything older than 2011? The 2011 has all the factory built in towing features that I love. But that 2005 is a really good deal on a nice truck too. Thanks in advance for your recommendations. 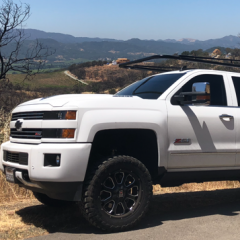 Hello I have a 2017 Silverado 2500HD, 2WD with stock LT265/60R20 tires and rims. I been spending countless hours reading on this topic, and still seem unsure of the answers. Ride quality is most important to us, so I would like to know what’s the best options to fit something like a Toyo AT2 Tire around 33” to 34” inches and 11” to 12” inches, maybe a 305/55-R20 ? Is their a better riding AT tire that last like the Toyo’s ? would I be able to get a negative offset so I have some lip or deeper dish vs the hub moved more out? I been reading positive offsets seem to fit a little Better with less rubbing issues? i think a 33” tire by around 11” wide would be a great fit for a leveling kit? last question, I was think of going max 2” leveling kit, but if I go with aftermarket keys, and shock extenders will it still be close or better then the factory ride? Can I add better shocks to help with the ride? Ride quality is really important to us. We don’t do much towing, Mostly highway/city driving, no off roading. i had a 2015 2500HD with 33” tires , 11” wide , 2-1/2” Ready lift level kit, and positive offset, but the ride stiffened up allot . We sold the truck and bought the 2017. I put this on a week ago but wanted to post some pics. Basically a bolt on tip like the 1500 (double wall, rolled edge, stainless) so after looking I could only 1 without aftermarket name branded all over it and still retain the OEM cooling design because all the other tips that were vented are single wall. Magnaflow (part # 35233) 5” inlet 6” outlet. It did not come with a clamp so I used a double bolt one for an 18-wheeler from NAPA (part # 733-3225). I did have to cut 10” of the OEM pipe off and it sticks out about 1/4” more. Let me know what you think or if you need any other info. Cost was around 100 bucks. I have a 2001 Silverado 2500 HD, wondering if I had a body control module issue, my heated seats don’t work, my driver side seat only worked half way i.e. The lumbar support works but the lean and moving the seat functions do not, along with my keyless entry not working but my power locks do work. Any ideas? I traded my 2012 Silverado 1500 for a new 2016 2500HD! It's an LT trim level, but has quite a few options. It has the All Star package and LT Plus package, which adds most of the important items. It also has a few extras, like the LED bed lighting and towing mirrors. MSRP was just a little over 50k. Here's a few completely stock, dealership photos. It looks pretty plain for a 50k truck! I'll start of by admitting I'm a noob when it comes to trucks. I have a 2015 Silverado 2500HD 4x4 Z71 LTZ with stock 265/60/20's. I have a new 1/2 mile long dirt driveway (New England,) which I have to plow. I've been back and forth about whether to get A/T's or M/S's... and sizes. I'd love a recommendation. I'm looking at getting new rims as I'll go with 17" or 18". Being a dirt driveway, it also get's pretty muddy. I need a tire I can also run on highway, but a good tire for plowing is key. Appreciate any suggestions. Thanks. I just installed a different engine in my 01 2500HD 6.0L the replacement engine was also supposed to be a 2001 engine, one of the coils packs was bad and I went to swap one off my old engine but they mounted different. Did GM use 2 different coils packs on the 2001 or is this a newer engine? Im sure this might have been covered someplace else but i couldnt find it. I have a 2015 gmc sierra 2500hd sle. The person who owned it before me installed cheap aftermarket tow mirrors and they jiggle all over the place on the highway. I would like to get some better quality mirrors. I'm just wondering if my truck supports the marker lights, blinkers, and reverse/cargo lights plug and play without making my own connections. Ok so we’re getting ready to put the replacement engine in my 2001 2500HD 6.0 and one of the exhaust bolts was broken of like they do. So we removed all the bolts and are going to replace them. So my question is where should I get the new bolts GM replacements or get them from somewhere else and use stainless or grade 10.9. And do we use anti-seize or not? Ok, something just started happening with our 2016 GMC 2500HD Denali 4x4 with the diesel. The remote door lock and unlock won't work every time from either of our fobs. We bought this truck last August so I can't imagine the batteries in both of our fobs have died at the exact same time and only 7 months in. My fob gets used the most with my wife's fob barely getting used at all. Anyone else experience/experiencing this? And, what did you do to remedy it? I guess we can try replacing batteries first, but batteries only lasting 7 months in a fob? And both failing at the same time, especially given one gets frequent use and one barely gets any use. We know it's not a fuse because it does work from time to time. Did I say I love my new truck? Well I just tore off the passenger side mirror exiting my garage. I'm just not used to the difference in width between this truck and my old 2006 GMC Sierra 2500HD. I took it in to my local Chevy dealer and shelled out $800 for the repair. Expensive lesson on why power fold in mirrors are there. There is one oddity however.... perhaps someone here can help me understand this. Immediately after I unplugged the wires from the dangling side view mirror I got a check engine light (P0073) air intake temp is what onstar said. So I just figured that by unplugging the mirror It caused the truck to throw that code. After replacing the side view mirror. My local Chevrolet dealer said that I needed to take the truck over to my local GMC dealer to have the check engine light problem corrected. 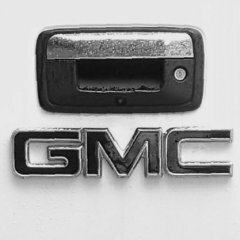 Their position is that since the truck is still under warranty, (and get this) since I did not buy the truck from them.....I would have to go to my nearest GMC dealer for any warranty work. Mind you that I bought this truck out of state...so it is not like my local GMC dealer is the selling dealer either. I explained to them that I believed that the code was the result of me tearing the mirror off since that is IMMEDIATELY preceeded the code. Regardless - I asked them to clear the code for me since they did the repair. They complied. Does that make sense that a Chevy dealer will repair a GMC truck (even had the mirror in stock) on my dime but if it is a warranty job shuffle me off to a GMC dealer? I mean is that legit? Hey guys, this is a officially my first post on this forum as a member! I've recently got my exhaust done for my 2007 GMC Sierra 2500HD Classic that I recently bought about 3 months ago now. I decided I wanted it pretty loud with a deep rumble with a good amount of drone but not obnoxious and screamy. I did a lot of research on a true dual setup and read that it would be louder than your standard single in dual out muffler. So I decided to have 2 Flowmaster Original 40 series mufflers installed with dual 2.5 inch pipes in and out coming out of the sides 45 degrees with 4x18" chrome slash cut tips. It's not giving me the volume and tone I was expecting, hearing how the 6.0 is a very noisy and loud engine to quiet down. It's barely louder than stock single exhaust on idle. I was thinking of taking it to another exhaust shop and having them run 3" pipes instead of 2.5" pipes since stock pipes are already dual 3", swapping out the original 40's and replacing them with super 44's. I hear that the 44's are more deeper and aggressive than all the 40 series that Flowmaster has to offer. I'm not really a big fan of the single chamber mufflers and straight through mufflers as they just sound too tinny and way to aggressive for my taste. I'm also aware that adding headers would really help, but I've seen videos of these things with stock manifolds and cats and they are VERY loud with the 2-chambered Flowmasters. Here's a list of things that I'm not happy about and a list of things I think I'm thinking of doing. It be really cool if you guys can share your knowledge and experiences with me to give me advice on what I should do. Not Happy: - Start up isn't very impressive (I feel like its sounds more like Flowmaster moderate sounding mufflers like the 50 series) - I get none of this "dreaded and obnoxious interior drone" the 6.0 is infamously known for, especially with the 40 series installed. Cruising in the city, it's not much louder than the stock muffler even when accelerating. It does drone just a little bit when going up hills or inclines though. (I'd love to have a decent amount of drone) - Not impressed by the exterior sound. I had my friend drive it as I stood outside and it was not loud at all, though it did have a nice sound to it. It had more of a moderate volume, sounding more like today's newer trucks with the stock duals that come with them. (I'd love to get a really loud deep rumble with a good amount of aggressiveness.) - The guy who did my exhaust seemed to have added 2.25" 40's instead of 2.5" but he stretched the inlet and outlet out to 2.5 inches, but still looks like there's a 2.25" choke point restricting the flow, but I don't know if that has an affect. - He welded my tips on weird, welding 10" of the pipe itself inside the tips What I'm thinking of doing: - Swapping out the 2.5 inch pipes with 3" pipes (I heard pipe diameter and muffler choice really have an affect on volume and tone) -Swapping the original 40's for 2 Flowmaster Super 44's - Adding an H-pipe - Put the mufflers as close to the cab as possible to increase cab resonance. Will the Flowmaster Super 44's and dual 3" pipes have an effect on volume then what I have already? What do you guys think? Let me know! Thanks! Ok so a while back I posted about my 2500HD running rough, I changed the Injectors (2 weren’t firing) and then it ran as bad if not worse and started knocking. Well today day I finally got around to pulling the engine apart to find #3 rod broke in half and into pieces. Anyone have any ideas on what happened? Hello I have 6,370 miles on a GMC 2016 2500HD gas 6.0L 4X4 truck and when I bought the truck I notice I had a alignment issue. I did had the dealership to fix the problems and a steering lose problems. They have fix the steering issue. But they didn't fix my alignment I had to go in and try to fix it myself. But I found out it was my suspension the whole time too. I notice the driver side is 1 inch lower then the passenger side. And the passenger side Is a 1 inch taller from the wheel. So it leaning over by looking at the truck So sometime when I was driving around I even hear a popping sound from the floorboard from making a full right turn when I hit a bump real hard or going into a bumpy drive way or pulling in to from a right hard trun from 4 way intersection or some residential from a dip it make a sound. When I went to the dealer ship the guy told me that is normal and can't even find any issue. Talk about lazy boring, argument oxy moron Name John thinking I was born yesterday. He wouldn't look at me in the eyes and to tell me or ask me anything. I hate that. He doesn't want to work with me and I hate talking to people that work at front the desk. Yeah right. Very odd for a guy to be telling me that.. The truck does leaning over to the left and make popping sound when hitting a bump making a full right turn. I did try to do some left turns real hard from hitting a bump I hear nothing from that side it took a bump like a champ. Can anyone help me how to fix this issue? Do I need a 2 inch lift? It doesn't feel right how can I fix this issue? Do I need a new kit? New arms? or maybe the manufactured put the wrong lift on the left side? It bugging me bad I just bought the truck and I already feel like I got a pieces of junk and got me frustrated. Like here we go again I have to deal with a junk for the rest of my life. So anyway can someone help me out? Any help will be much appreciated. Where can I find this hood?? Where can I find this Denali 2500HD Hood Scoop? Where can I find this Denali 2500HD Hood?